White Jackets There are 4 products. Corbara’s wear: the white uniforms for restaurants, made of a lightweight fabric for summer. 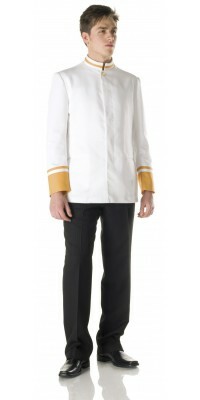 This series of uniforms for restaurants is especially suitable for those who prefer a lightweight and breathable waiter jacket; in fact, the garments proposed are made of 50% Cotton 50% Polyester Comfort Satin , a “cotton on the skin” gabardine, perfect for summer; this fabric, thanks to its cotton blend composition, has the advantage of a long duration and a great resistance to washes, ensuring at the same time coolness and comfort, just like a pure 100% cotton fabric. In this series the classic men's Roma jacket, matched with the women's Pavia Spencer, is proposed; both models are especially suitable for a classic and elegant restaurant room. Moreover, two models with the Mandarin collar are available: the men's Fregene jacket and the women's Gaeta jacket, both with contrasting inserts on the sleeves and the collar; this type of Mandarin jackets is very practical, as it doesn’t require any shirt, and therefore is perfect for those who work with extra waiters and in catering services. 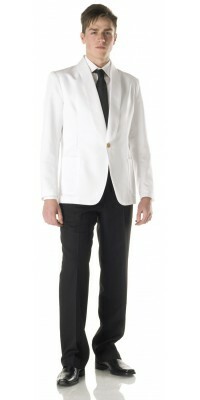 Waiters' jacket with shawl collar, model Roma White with one gold button Light-weight, ideal for summer - cotton on the skin - Unlined Immediately available for delivery: sizes from 46 to 56 Made of Comfort Satin, 50% Cot., 50% Pol. Waitresses' short jacket, model Pavia White with one gold button Light-weight, ideal for summer - cotton on the skin - Unlined Immediately available for delivery: sizes from 42 to 48 Made of Comfort Satin, 50% Cot., 50% Pol. Waiter's jacket with mandarin collar, model Fregene White with ochre profiles on the collar and the cuffs Light-weight, ideal for summer - cotton on the skin - Unlined Immediately available for delivery: sizes from S to XL Made of Comfort Satin, 50% Cot., 50% Pol. Waitress' jacket, model Gaeta White with ochre profiles on the collar and the cuffs Light-weight, ideal for summer - cotton on the skin - Unlined Immediately available for delivery: sizes from S to XL Made of Comfort Satin, 50% Cot., 50% Pol.